Happy Thursday to you crypto traders and enthusiasts, we hope you’ve had a good week so far and that you didn’t get taken out during the market turmoil earlier this week. If you were one of the unlucky ones to cash out in the sub-$7000 range, selling all your altcoins in the process, don’t beat yourself up too much. Bitcoin has yet to prove it can remain above $8000 and the stock market has yet to prove that it isn’t amid a sizeable correction. Why does it matter? We explain more in detail below. The price of BTC managed to clear $8000 as of Thursday morning following a turbulent sell-off that brought bitcoin to its lowest levels of the year. Prices dipped down close to $6000 before rapidly ascending above $8000 amidst high trading volume, the likes of which have not been seen since last November, during bitcoin’s rapid climb to $19,000. During a steady downtrend from $9100 on Feb 3rd to $6100 on Feb 5th, trading volume averaged between $6 – $9 billion worth of bitcoin per day. During this week’s recovery period, from $6100 on Feb 6th to $8500 on Feb 8th, trading volume averaged between $9 and $14 billion per day, signifying a massive influx of investor money returning to the market. BTC volume bars indicate an intense period of trading this month. The past 90 days have seen some of the most volatile bitcoin prices ever, surpassing those encountered during the fall of MtGOX, from December 2013 to March 2014. However, unlike the last days of MtGOX, the blame can be spread globally and does not rest on the shoulders of any one or small group of individuals. Looming threats of regulation, a shaky stock market, institutional profit taking and oversaturation of the cryptosphere (the ecosystem of all blockchain-based projects and products) are all culprits in the bursting of the long feared “crypto bubble.” With the price of BTC still down 40% in the last 30 days, and at a paltry 43% of its all-time highs set in December, perhaps this weeks moves mark the beginning of a trend reversal which sees bitcoin either climb, or at least stabilize, in price. Binance, one of the world’s biggest altcoin exchanges by volume, is confirmed to have suspended trading and withdrawal functions on the afternoon of February 7th, setting off a small wave of panic as prices stopped moving and coins became trapped on the exchange. Binance staff and executives took to social media shortly after the unexpected freezing of exchange functions, sending out tweets in an attempt to quell user fears that their coins were gone. 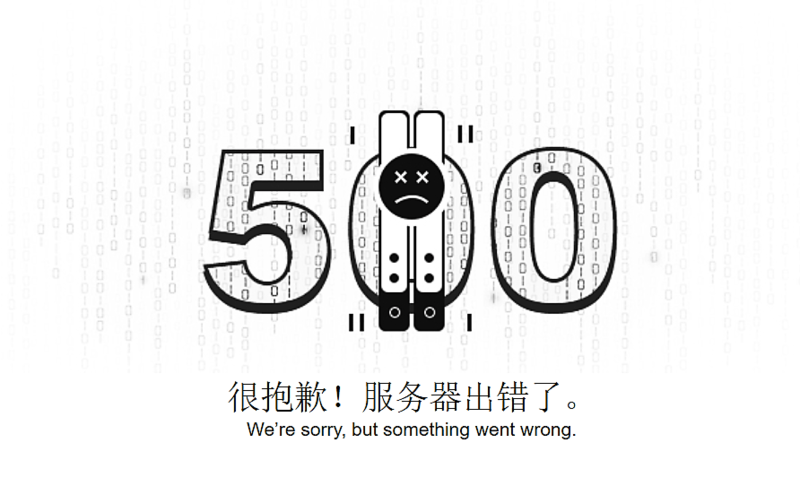 Binance CEO Changpeng Zhao, best known for his rise to crypto billionaire status in a period of less than a year, said exchange servers were at fault and that the system would have to be taken down and upgraded due to the steady influx of new members. Coin traders and investors have good reason to be jittery and jumpy when their funds are on the line – the past few years have seen a rise in increasingly sophisticated plots by crypto service purveyors to separate users from their funds. From MtGOX to Mintpal to Cryptsy – all exchange titans of their day – time has proved that human operators tend to be the least trustworthy thing about the crypto trading industry. While coding errors do occasionally bring down websites, wallets and entire coins, it is usually a “bug” or “design flaw” in human conscience that causes the outright disappearance of user funds. Luckily for Binance users, an “exit scam” seems unlikely to be the case. The exchange is wildly popular, makes substantial profits through legal means, and is therefore under a tremendous amount of scrutiny by world governments and the crypto community. Honesty about growing pains associated with an operation of their size, while overcoming the challenges of navigating territories in business, technology and finance previously unexplored is a more rational explanation for Binance’s (likely) temporary closure. 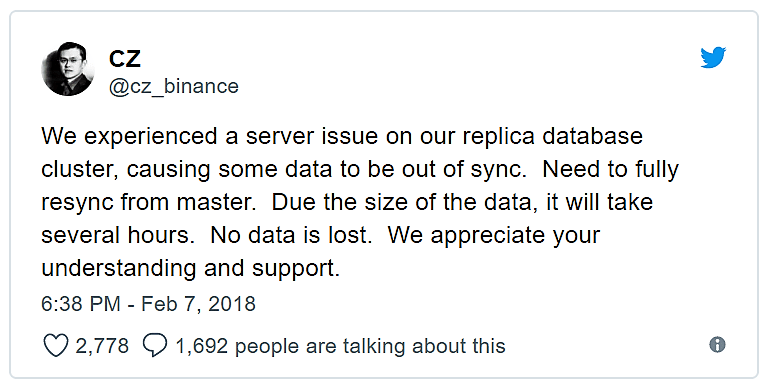 The most recent update from the Binance team states that they plan to resume business in the AM of February 9th. 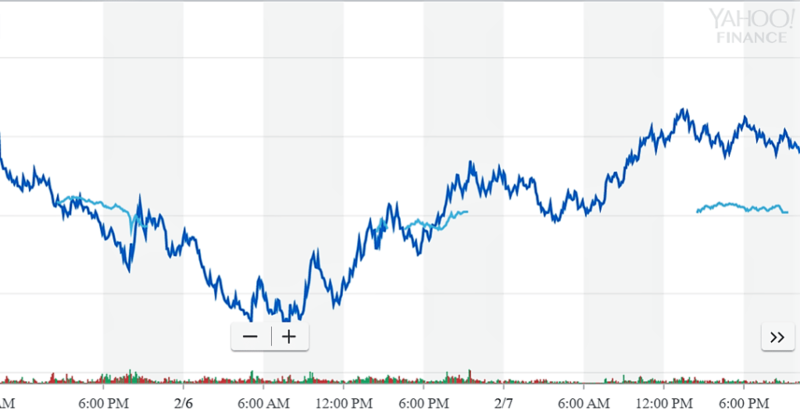 The stock market was down over 3% on Thursday afternoon, extending February’s losses for the Dow Jones Industrial Average (DJIA) to 8%. A booming stock market through much of bitcoin’s existence has benefitted its chances of adoption by Wall Street, as large-scale investors and trading funds used profits accrued through traditional means to fuel investments in high-risk, highly-speculative vehicles like cryptocurrency and blockchain-based products. Unsurprisingly, some of the biggest losing stocks in the last 2 weeks are those of companies and corporations attempting to capitalize on the spectacular financial successes of bitcoin and blockchain technology. Riot Blockchain (RIOT) and Long Blockchain (LBCC), the two crypto startup investment companies listed on NASDAQ, are down 17% and 18% respectively. The sudden downturn of the stock market compounds the problem of falling bitcoin prices, resulting in a decrease in price of almost 40% for Long Blockchain in the last 30 days. This past week saw the launch of two blockchain-based ETFs, one based in the U.S. and the other based in Canada, which are both currently down between 2 and 5% since their inception. These funds allow the public to indirectly invest in the future success of a diverse basket of blockchain-driven companies which are hand selected by the ETF owners. As such, they hope to represent the future of blockchain applications to business solutions. The price of BTC moved independently from the stock market for several years until things changed with the influx of Wall Street-size money that started in early 2017. A year later, the price of bitcoin is considered to be not only correlated with the stock market but also a potential indicator of overall market health. Bitcoin is still categorized as a high-risk investment, and as such its changing price can be used to gauge overall market “risk appetite,” or the generalized amount of risk that investors are willing to take on. As economic markets across America have fared significantly well over the last 7 years, the idea of a stock market correction, which is defined as a drop of 10% or more from the peak of a market, is entirely reasonable. During periods of panic selling it would also reason that bitcoin and cryptocurrency would be the first to go, and as such it may also be the first to come back. On the subject of blockchain stocks, Forbes recently released their top 5 picks for companies employing blockchain-based technology for the year. They include the massive tech exchange NASDAQ (which has been experimenting with the blockchain since 2013), IBM, Hitachi, Daimler AG and newcomer startup Hive Blockchain Technologies. Forbes cites the blockchain’s estimated potential to store 10% of the world’s GDP by 2027 as a leading driver behind their predictions of explosive growth in the industry over the next decade.